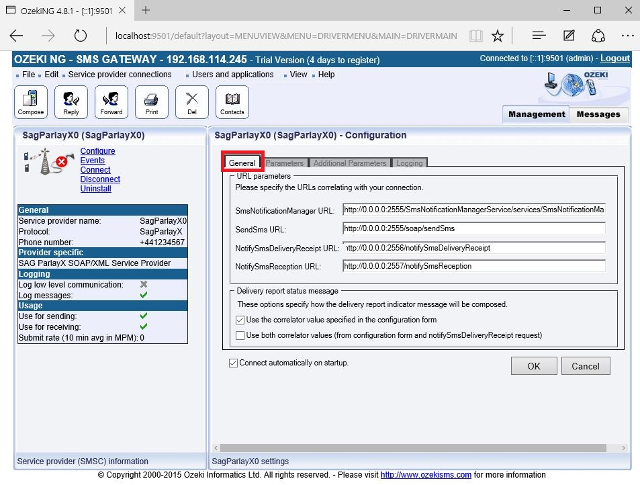 In this page you can find instructions about how to install and configure the SAG ParlayX SOAP/XML service provider connection for SMS messaging using the Ozeki NG SMS Gateway software. The DataSync interface of the SAG ParlayX protocol is implemented in a third party application, which can be downloaded on the link below. SAG ParlayX SOAP/XML Service Provider Connection uses ParlayX Web Services to connect to the SMSC of your choice. You can send and receive incoming SMS messages or notifications with this service provider. 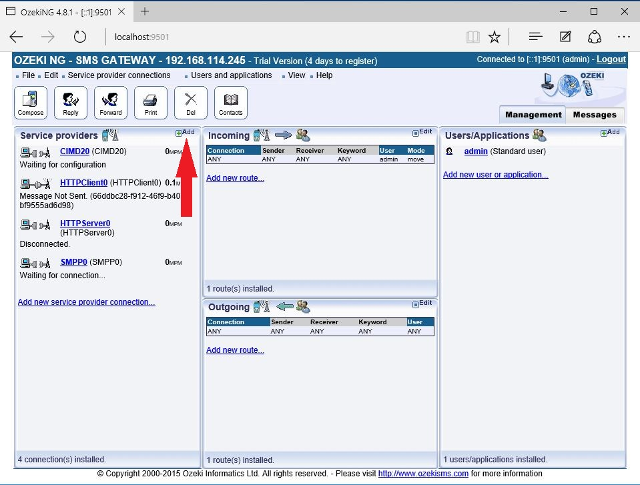 You can install the SAG ParlayX SOAP/XML Service Provider connection through the graphical user interface of Ozeki NG SMS Gateway. First, click on the Add button in the top right-hand corner of the Service provider's panel on the Management page. 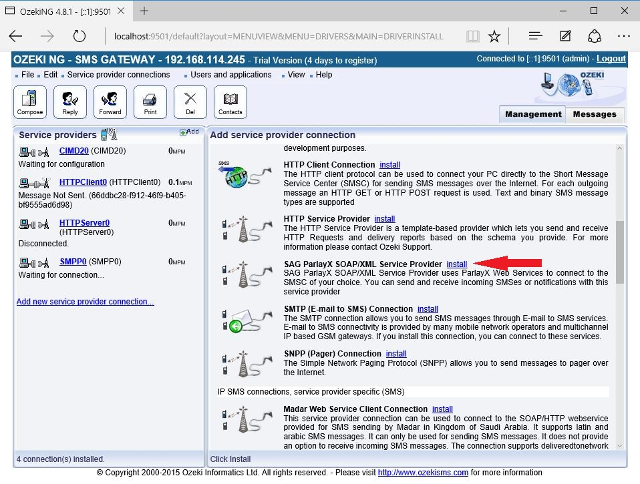 On the next page you can find the SAG ParlayX SOAP/XML Service Provider connection in the IP SMS connections (SMS) section. Click on the Install button to create the new connection. On the following page you can find the configuration form of the connection. Under General tab, you need to specify the connection parameters for message submission that are correlating with your connection. The next tab is the Parameters tab, which consist of three parts. You can configure Reference Parameters, Charging Information and Additional Parameters. In the Reference Parameters section you can specify whether to append a receipt request to outgoing messages. Enable the checkbox if you would like to Send Receipt Request. 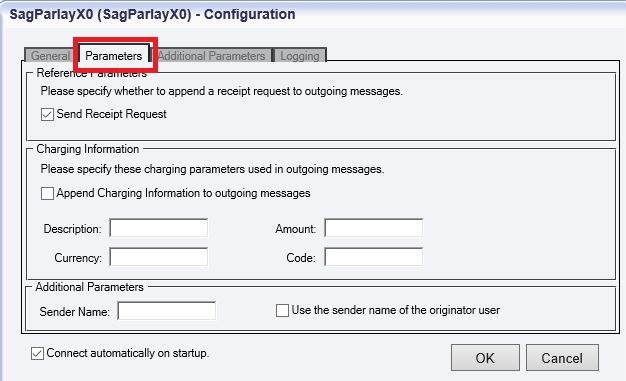 If you would like to use Charging Information, enable the Append Charging Information to outgoing messages checkbox. In the Additional Parameters section you can provide the Sender Name. If you want to Override linkid whenever a new message arrives from the SMSC, enable the checkbox, which belongs to this settings. 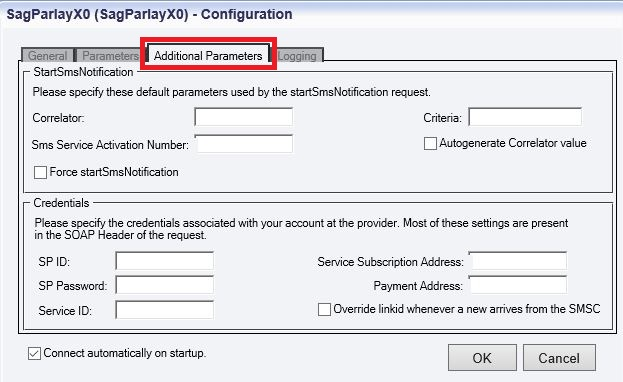 Under the Additional Parameters tab you can add some parameters used by the StartSmsNotification request, such as Correlator, Criteria and Sms Service Activation Number. In the next section of this tab you can specify the Credentials associated with your account at the provider. Most of these settings are present in the SOAP Header of the request. These are the SP ID, SP Password, Service ID, Service Subscription Address and Payment Address. In the Logging tab you can choose whether to make the program write log entries about sent and received messages in human readable format and/or log low level communication. Choosing the second option the program produces logfiles containing binary codes representing the communication data. In the Log file settings section of the tab, you can give the Log directory, the maximum log file size and the number of rotated logfiles. Log rotation saves disk space, as it ensures that olderlogfiles will be automatically deleted from the log directory. In the Maximum log file size text box you can specify the maximum size of a logfile. Once this size is reached, a new logfile will be created.